Card Crawl is a solitaire-style dungeon crawler game played with a modified deck of standard cards. Clear the dungeon of 54 cards by using item-cards, slaying monsters and managing your limited inventory. On each run, you can use five ability-cards (mini deck building) to gain unique skills. By collecting gold, you can unlock 35 more ability-cards to access new tactics and even higher scores. 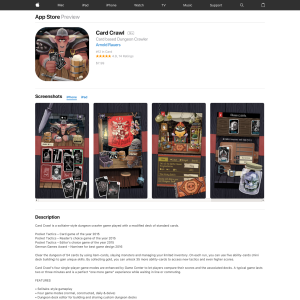 Card Crawl’s four single-player game modes are enhanced by Game Center to let players compare their scores and the associated decks. A typical game lasts two or three minutes and is a perfect “one more game” experience while waiting in line or commuting.